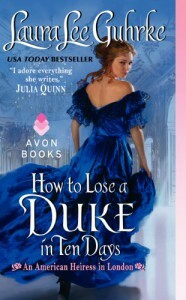 How to Lose a Duke in Ten Days is Laura Lee Guhrke’s second book in the An American Heiress in London Series. I thought a story focusing on the arranged marriage that was never consummated and the matchmaking failure Belinda (When the Marquess Met His Match, An American Heiress in London #1) made would be a delicious story. However, I was disappointed…again despite Guhrke being a favorite author. I love the premise: arranged marriage, husband comes back to claim his bride, and hero and heroine discover love. But that was about it. The story didn’t wow me at all and I felt that this had been done before. I did not like that Edie was just playing hard to get. I felt that Edie’s reasons for not having a real marriage was too overdone. I understand the trauma but it was too much. I am giving this book 3-3.5 stars. This is a good read but I have read better from Laura Lee Guhrke. Here’s hoping the third book in the series would blow me away.